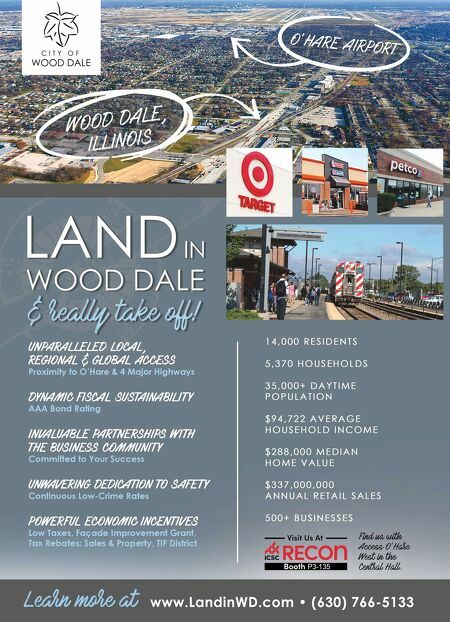 BOTTLEWORKS 242 • SHOPPING CENTER BUSINESS • May 2018 stay very attuned to the authenticity of the look and feel and not try to overdo it," Gerbitz says of the future food hall. "It's a garage. We don't want to over-fin- ish it or polish it too much. The most challenging part of keeping this fresh and unique will be the tenants we bring in. We're not looking to do 25 of these across the country. This is something that just fits with Mass Ave., which is a foodie district." Gerbitz says the Bottleworks develop- ment is the last section of the area to be repurposed. In its prime, approximately 1870 into the 1930s, Massachusetts Ave- nue served northeastern Indianapolis as a hub for commercial, cultural and employ- ment activities. Today, the five-block area is known for its restaurants, galleries and boutique shops. To keep the retail lineup fresh and unex- pected, Gerbitz says Hendricks is looking into potential tenants of the ilk of a barber or possibly a distiller. "We want to offer something new for people. At the same time, we want the food hall to feel like an old-school coffee shop. The place where you would once go to get coffee, talk and maybe hear some music." Hendricks will be adding a stage to its garage food hall area and plans to book local and regional bands. "All of those details are going to be real- ly important to the overall feel of the food hall. If we do our job right, we believe pret- ty strongly that the food hall alone should be able to draw in anywhere from 1.5 to 2 million visitors a year." 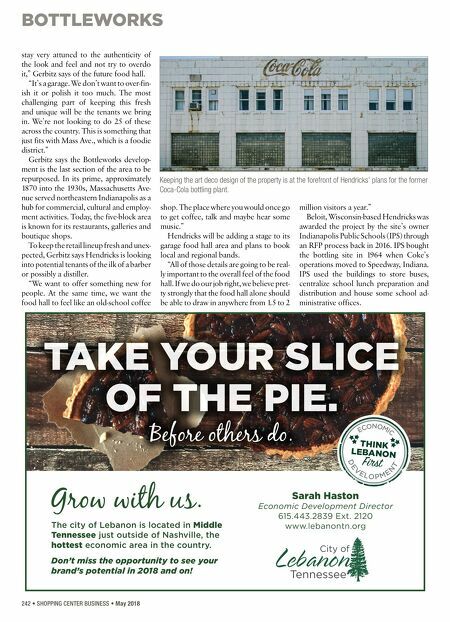 Beloit, Wisconsin-based Hendricks was awarded the project by the site's owner Indianapolis Public Schools (IPS) through an RFP process back in 2016. IPS bought the bottling site in 1964 when Coke's operations moved to Speedway, Indiana. IPS used the buildings to store buses, centralize school lunch preparation and distribution and house some school ad- ministrative offices. Keeping the art deco design of the property is at the forefront of Hendricks' plans for the former Coca-Cola bottling plant. TAKE YOUR SLICE OF THE PIE. Before others do. THINK LEBANON Fst E C O N O M I C D E V E L O P M E N T Sarah Haston Economic Development Director 615.443.2839 Ext. 2120 www.lebanontn.org The city of Lebanon is located in Middle Tennessee just outside of Nashville, the hottest economic area in the country. Don't miss the opportunity to see your brand's potential in 2018 and on!